As officials nationwide talk about the need to better police-community relations, a small act of kindness by a Virginia state trooper has gotten widespread attention on social media. Dr. Nada Owusu, a pediatrician in Danville, Va., posted a photo to Facebook of her wide-eyed son standing next to Officer Matt Okes, praising the officer for "being a good person waiting with my son" after he got a flat tire driving home from Virginia Tech. It has over 18,000 shares as of Tuesday morning. "This kind officer approached him, didn't ask if the little Mercedes was stolen, but rather got on his knees to replace his tire," Owusu wrote. 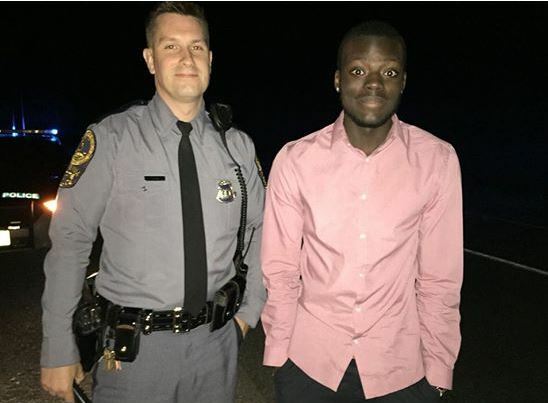 Okes positioned his well-lit cruiser to make sure truckers and other drivers on Route 220 south were aware of Joseph Owusu's stranded car as AAA and his worried parents responded, reports CBS affiliate WTVR in Richmond. Nada Owusu said she wanted to share with the world the simple act of kindness because, "there's a lot of good in America and that needs to be heard. Police need our support."